Scientists in UK and Kenya reported the result of research that the winning women's 100-meter sprint time of 8.079 second would be faster than that of the men's winning time of 8.098 for the first time ever at the 2156 Olympics . Their analysis is based on the data on the winning times of the men's and women's Olympic finals over the past 100 years. According to the supplementary information at Nature's website, the data span the years from 1928 to 2004 (76 years) for women, and from 1900 to 2004 (104 years) for men. After testing a range of curve-fitting procedures, the scientists adopted the simple linear relationships between the Olympic year and the winning time. The extrapolation to the year 2156 goes ahead for 152 years, just two times of the time span in which the data for women exist. From my much experience of curve fitting to data , I suppose that the validity of such wild extrapolation is quite dubious. It is just a child's guesswork. Reliable extrapolation would be up to the year of about 2042 (2004 plus a half of 76). -- Can I live until that year? -- If the linear decrease of the winning time goes on and on, there would come the year when one can reach the goal in no time (this is a child's words). A. J. Tatem, C. A. Guerra, P. M. Atkinson and S. I. Hay, Nature Vol. 431, p. 525 (2004). See the list of my academic papers. In the final game of this season on October 3, 2004, Ichiro Suzuki of Seattle Mariners established a new record, 262, for the number of hits in a season of major league baseball. The previous record was 287 set by George Sisler in 1920. While he was still fighting for a tie, a report in the New York Times praised him to be "an artist who makes the field his canvas," analyzing his five techniques of batting . Those were the chop, the flip, the seeker, the standard and the power stroke. What made possible his artistic play? Thomas Edison used to say, "Genius was 1 percent inspiration and 99 percent perspiration." Ichiro surely has inspiration, but a glimpse of his much perspiration can be made in his attitude of living; he neither goes to see movies to protect his eyes, nor plays golf not to destroy his batting form. Persons of every profession should learn such a use of great moderation. When he broke his own record of the number of hits in a season, Ichiro said, "I want to go over my own best, and it is challenging to do so, so far as it is a possibility." These words also reflect his constant perspiration. Now there are many fans of Ichiro in USA and Japan. However, I am one of the oldest fans of Ichiro, because my favorite Japanese baseball team has been Orix Blue Wave, to which he belonged before joining the major league. That team is now going to be united with Kintetsu Buffaloes to become Orix Buffaloes. The manager Akira Ogi who brought up Ichiro comes back as the manager of the new team. Can he foster another Ichiro? Rainbow seen in Sakai after the passage of typhoon 21. Last Friday typhoon 21 passed through Kyushu, Shikoku and Kinki District, and gave much damage at many places, especially in Mie Prefecture, due to heavy rainfall. 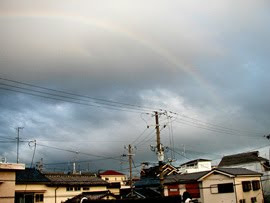 Another thing it brought was a rainbow seen here in Sakai next morning. Leonard Mlodinow writes the following story in his book "Feynman's Rainbow" : On one of the last days in his life, Richard Feynman was gazing at a rainbow, and asked Mlodinow what he thought was the salient feature of the rainbow that had inspired Descartes' mathematical analysis of it. The latter gave elaborate guesses based on the geometrical and physical nature of the rainbow, but Feynman simply said this: It might have been that Descartes thought rainbows were beautiful. You can learn about Descartes' analysis of the rainbow at websites [2,3]. L. Mlodinow, "Feynman's Rainbow," pp. 117 and 118 (Warner Books, New York, 2003); Read my review of this book.